Product #3084 | SKU 1SKB-R6020W | 0.0 (no ratings yet) Thanks for your rating! 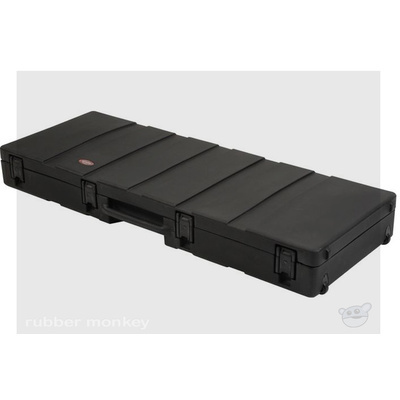 The SKB R6020W Roto-Molded 88 Note Keyboard Case is a hard polyethylene case with wheels. The case features a molded-in unbreakable carrying handle and integrated valance design which incorporates latching system. These latches are made with an indestructible material, easy to operate and can take the rigors of the road. Each case has roller blade style wheels for easy transport. With the new corner cleat system keyboardists can easily adjust the cleat positions to accommodate a variety of keyboard dimensions. Roto molded keyboard case made to fit 88 note keyboards. Fiberglass reinforced nylon trigger release latching system. Corner cleat system keyboardists can easily adjust the cleat positions to accommodate a variety of keyboard dimensions. Type of Closure:	Fiberglass reinforced nylon trigger release latching system.